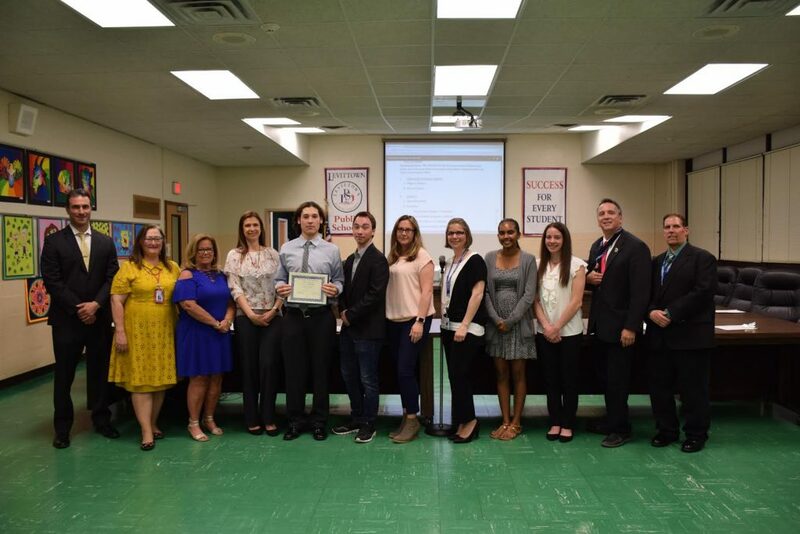 During the May 2 public meeting of the Levittown Board of Education, the district’s trustees recognized Division Avenue High School senior Jonathan Swift, who recently acquired the rank of Eagle Scout with Boy Scout Troop 330. To receive this status, Jonathan renovated the cafeteria at St. Bernard’s Center for Religious Education in Levittown by collecting donations from local establishments, retailers and private donors. He also enlisted the assistance of his troop, friends and family to clean the kitchen, spackle and paint the walls and clean the stainless steel appliances. Following the renovation, Jonathan and Troop 330 prepared a meal for St. Raymond’s Church and staff members. Photo Caption: Division Avenue High School student and Troop 330 Eagle Scout Jonathan Swift, center, is pictured with (from left) Principal John Coscia, Superintendent of Schools Dr. Tonie McDonald, Board of Education President Peggy Marenghi, trustees Christina Lang, Dillon Cain, Jennifer Messina, Vice President Marianne Adrian, Division Avenue High School board liaison Sonia Inderjit, MacArthur High School board liaison Erin Cassano and trustees Michael Pappas and James Moran.